On the way back to the city, in the deepening dusk we pass a typical new police station: a cube of glass, brightly lit inside. I see one policeman writing at his desk as we flash by in our green BMW, expertly handled by our professional driver. We are in the Republic of Georgia, in May, 2012, and the glass police stations symbolize the government’s new policy of anti-corruption and transparency. We’re driving back to the capital, Tbilisi, from Georgia’s top wine region, in the southeastern part of the country. We’ve just spent the day in this wine region—called Kakheti—after tasting at several other wineries near Tbilisi earlier in the week. Kakheti lies along the edge of the Caucasus mountain range, north of Armenia and Azerbaijan. Just over the nearby mountains lies the Russian border and the bitterly contested area of Chechnya. We are sated from our dinner at Pheasant’s Tears winery, where, at a table set out in the lawn, we had a small feast including crunchy fresh salads, grilled-to-order meats and an irresistible platter of tiny new potatoes baked in home-made, roasted sunflower-seed oil and sprinkled with just the right amount of salt. With the music of a nearby students’ festival as background for our dinner, we also sampled the wines: red, white, dry and sweet, made from native grapes. These wines are exported to nine countries including the US, China and Japan. The winery only makes 45,000 bottles a year, so the allotments are small. Now that Georgia is an independent republic, a new company has taken over this space, renovating the tunnels, storing their own wines here, and opening a restaurant in the former official tasting room on the hillside high above the tunnels. The Khareba winery makes wine here from its own vineyards in this region (Kakheti) as well as in Central Georgia. Kakheti is the premium wine region of Georgia, located in the southeastern part of the country, along slopes and valleys interspersed with farmland and villages where people seem to live in a range of lifestyle from pre-industrial to Soviet. There are also a few large towns with a mix of modern and Soviet-era buildings. And, there is a growing number of hotels and restaurants, catering to what Georgians hope is a burgeoning wine tourism industry in the country. As this wine region is only two hours’ drive from Tbilisi, the new establishments were already drawing weekend visitors during this year’s warm month of May. 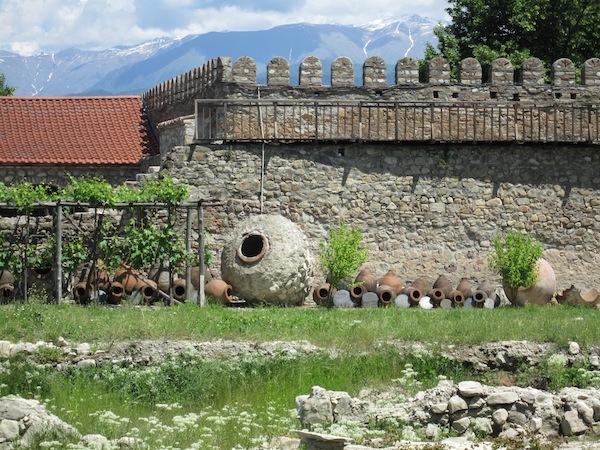 Come full-on summer when temperatures soar in the city, it looks like many more people will be lured by the Kakheti region’s bucolic landscape and its wines. So what are the wines like? As I explored, I found three distinctly different styles of winemaking. The first and newest—and smallest percentage—is Western-style production of both white and red wines: dry, and vinified in small, modern stainless steel vats, and sometimes finished in oak barrels. 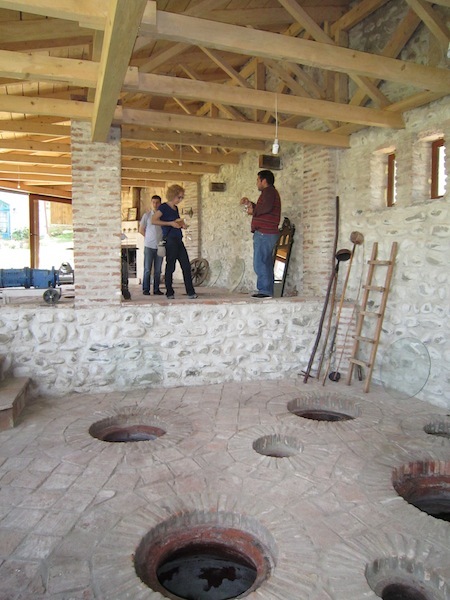 The second is traditional winemaking in the sense of Soviet-era and earlier winemaking. There are whites of varying quality and sweetness. As I understand it, more red wine in this style is exported. And most of these exported reds are slightly sweet—a style that is in great demand even today in the former Soviet satellite and Baltic countries, where Georgian wines still retain their top reputation. 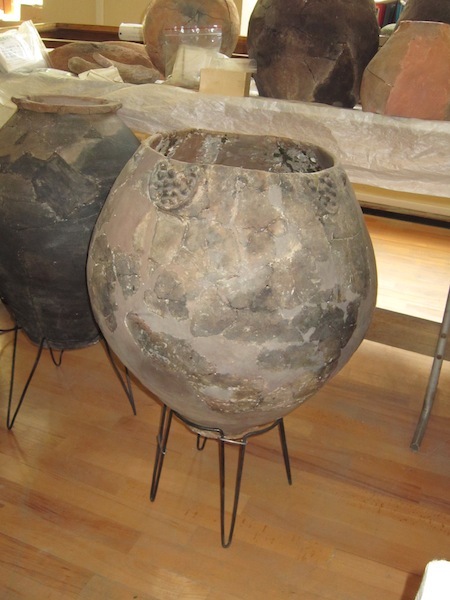 The third style is an ancient one: wines made in large, clay amphora-shaped vessels that in Georgia are called qvevri (also spelled kvevri). As you may know, amphora-made wines are currently undergoing a revival by a small number of intrigued winemakers around the world. Georgia’s winemaking method differs from amphora production in that amphoras sit above ground, while qvevris are buried in the ground, so the Georgian wines can be vinified as well as aged underground. White wines make up 70% of Georgia’s current production and consumption. The “white” qvevri wines are actually amber-colored, and fall into the trendy category of “orange wines” (well, it’s trendy for us wine geeks). The color and style of the wine is due both to the indigenous Georgian grapes that are used, and to the method of wine production. Wines are fermented in whole bunches, and they gain color from even the skins of the “white” grapes, which actually range in color from various green hues to shades of dark yellow and pink. The wines also gain tannins, more body, and a characteristic tangy flavor which, if you’re not careful, you could confuse with pure oxidation. But these wines are not classically oxidized. They are fermented in open-top qvevris with some daily stirring of the skins and stems that rise to the top and form a cap that effectively prevents oxidation. However, qvevri tops are very small; the openings are often 18 inches or less in diameter. And the fermentation is not hot, because the in-ground temperature is always cool. There can be some heat exchange with the surrounding soil, so careful winemakers like young titan George Solomnishvili at Chateau Mere use qvevris spaced some distance apart in alternate rows for the different grapes — which are harvested at different times, of course. Incidentally, Chateau Mere is one of the new oenotourism stops in Kakheti. In addition to a winery and riding stable, the property boasts a boutique hotel with a pool and a large restaurant decorated with antiques. It is newly constructed, but with the ambience of an old country-style hotel. From the terrace, there’s a panoramic view of the Kakheti region. While the white wines can remain in the qvevris with their stems and skins, in some places – especially in the Kartli region around Tbilisi — the wines are racked off and only the clear wine is aged in the sealed qvevris underground. In all areas, red wines tend to be racked off right after fermentation because the skins and other material would make the wines too rough. Nowadays, the wines are usually bottled after five or six months, though some people are experimenting with barrel ageing. Most of the barrels I saw were made of oak from Georgia or surrounding countries, though I did see some new and reconditioned top-quality French oak barrels. Generally, these would be used for wines made in a Western style, not qvevri wines. As Western (or international) style is the smallest percentage of their wine production—and pretty much understandable to most of you reading this—I won’t go into production methods here, except to mention that when it involves tanks for vinification and storage, Georgians may use tanks of any size, from modern, small, shiny stainless steel to giant, Soviet-era steel tanks in an industrial winery like Tbilvino. Speaking of Tbilvino, though huge in size and located at in a renovated Soviet-era wine factory complex near Tbilisi, here I also tasted some very good wines from the smaller denominated areas (AOCs) like Mukuzani and Tsinandali. 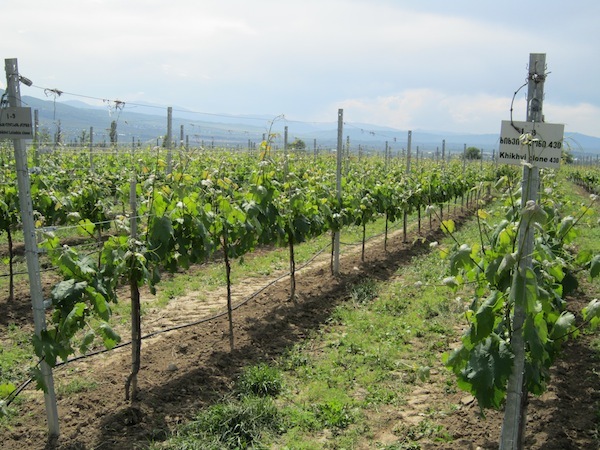 The Georgian Wine Association (GWA) has defined 18 AOCs, with more to come. Working with some international funding, the GWA is a very well-organized and pro-active organization, hosting wine conferences and promoting Georgian wines with a presence at major wine trade fairs around the world. It also acknowledges the astounding number of 525 native grapes. Four hundred and thirty of these have already been planted in experimental vineyards and nurseries at the National Center for Grapevine and Fruit Tree Planting Material Propagation. Speaking of vineyards, it’s also interesting to note that in Georgia people just laughed when I asked them if they hand-harvested their grapes. Certainly they hand-harvest, who has the money to buy harvesting equipment, even if they wanted to? And at this point in the global-downturn economy they still have people willing to work in the vineyards. Near Tbilisi, Chateau Mukhrani is another Western-style winery, with a full complement of good wines from white to rosé to red. Now owned and managed by Europeans, its 19th century chateau building is undergoing a complete restoration and renovation which incorporates a vast underground cellar. When finished later this year, the lawns will be configured to host large, outdoor concerts for an audience of several thousand. 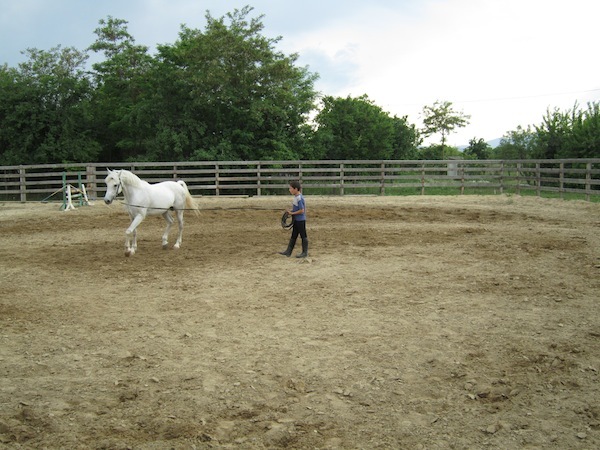 In addition, there are spotless, deluxe horse stables on the grounds—where I was shown a splendid, small white horse owned by the head of the Georgian Orthodox church, which is regularly exercised for him there. Culturally, wine has been a part of Georgian life for untold centuries; everyone I met told me it was a requirement at all family gatherings as well as religious events. One of their most famous monasteries, Alaverdi, now makes wine, and has a respectable wine cellar, too. When I asked how the monks learned to make wine in the post-Soviet era, people looked at me like I was crazy; every family knows how to make wine! There’s always an uncle or father or brother who teaches the next generation. But perhaps because they have not been well-known outside the former Soviet countries, Georgia’s traditional-style wines, especially the red wines, are often mistakenly dismissed by wine writers from the West. Yes, there are some that are indifferently made and taste of little more than fermented grape juice. But there are others—mainly made with the red Saperavi grape—that are well made, and a nice balanced of fruit and tannins. These are usually wines characterized as “semi-dry’ (10-30 grams/liter of residual sugar) or “semi-sweet (30-50 g/l). I found they paired beautifully with a range of foods from nuts to light meats liked grilled pork kebabs. 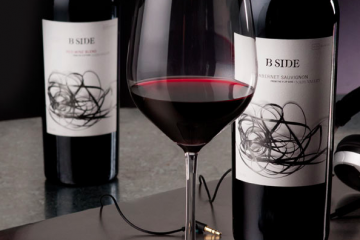 The predominant fruit aromas and flavors are cassis, blackberry and blueberry. Depending on the perceived sweetness and fruitiness of a wine, it can be served as an aperitif, with a meal, or as part of a dessert course. As previously mentioned, it would be a sad mistake for Western journalists to dismiss Georgia’s traditional wines. Unfortunately, I’ve seen that journalists are starting to influence wine stakeholders in Georgia, and consequently causing them to question their pride in these types of wines. And this is the time when Georgian winemakers do not want to give up on their indigenous grapes and traditional wines. This is when they should be working on improving the quality of all their wines, in order to forge a new (very necessary) national identity for themselves on the world market. Recently, a Nielsen study came out showing an increase in consumption this spring of 114% in the red sweet wine category. Georgians are already producing a fair amount of sweet reds and exporting the lion’s share to admittedly-undemanding markets in the Baltic and former Soviet countries. Perhaps Georgian winemakers, with more quality control in place for their sweet reds, could tap into the growing market for these wines worldwide. Overall, Georgians are aggressively marketing their wines both in nearby countries and in China, and they are beginning to make their presence much better known in Europe, even as they attempt to expand to the US market. As a small country, Georgia is well aware it cannot hope to compete quantity-wise with countries such as former New World newcomers like Chile or Australia. 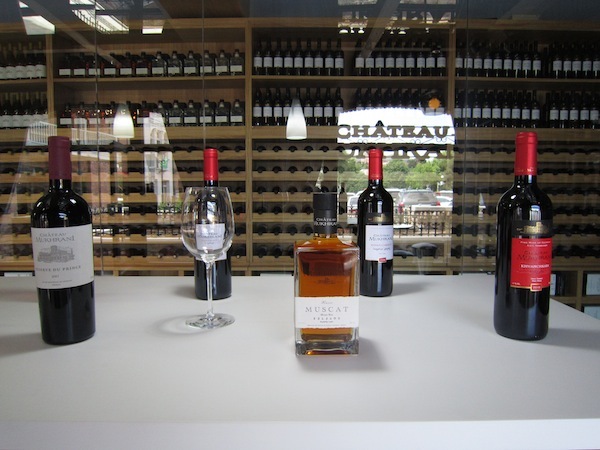 However, Georgians feel they do have a lot to offer on the world market; they want to carefully position their wines at mid-tier pricing, both to indicate quality and to manage quantity expectations. Excellent article! Just one thing to point out, Georgia and Russia are not in a conflict over Chechnya, nor is Chechnya a ‘contested territory.’ The contested territories are Abkhazia and South Ossetia. Nice article and interesting information about the Georgian wine scene, it’s always refreshing when a wine writer writes about a wine region thats off the beaten track so to speak. I had thought that all or almost all Georgian wine was sweet so it’s good to know that they make different styles. I hope that Georgian wine makers can find their way and market them more successfully internationally while avoiding the quagmire of regional politics there.